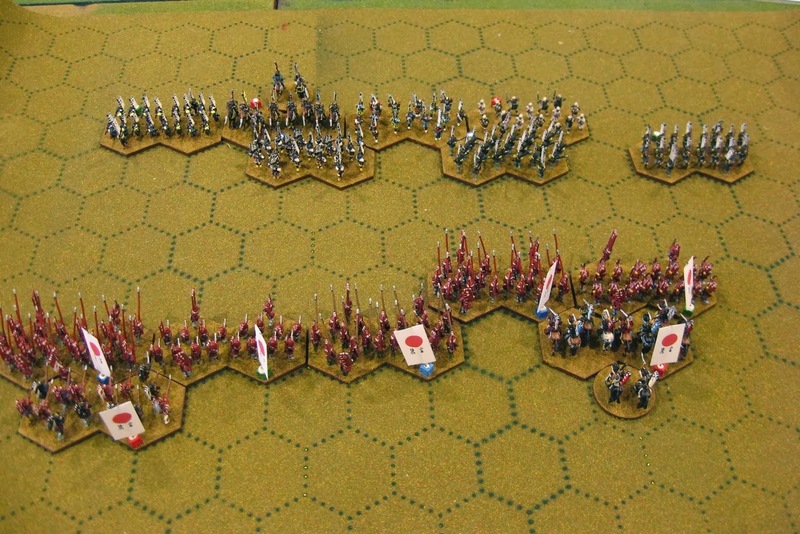 The more I play the Command & Colors derivatives, the more I enjoy gaming on the hex mat with miniatures. 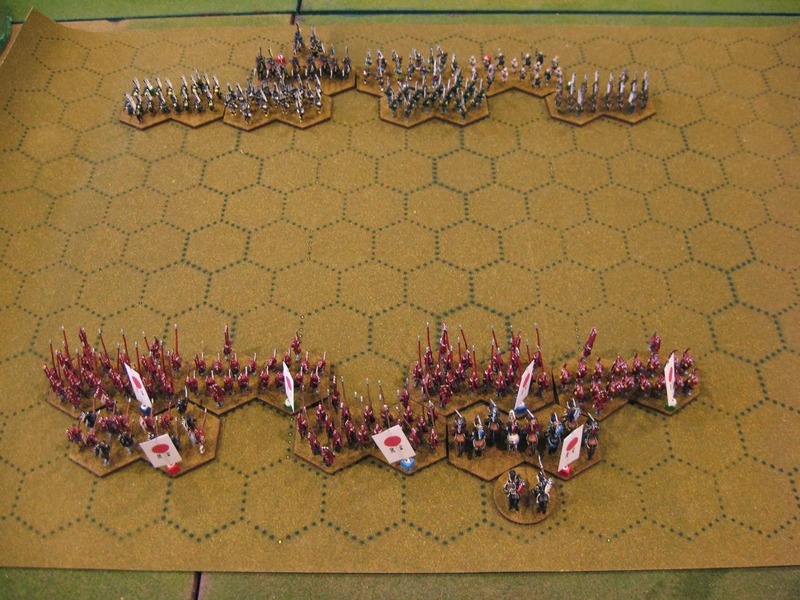 With hexes, or any grid that governs game play, both precision and speed of play increases. No more fiddling around with exact movement distances, hair-splitting angles of attack, or other such minutiae. 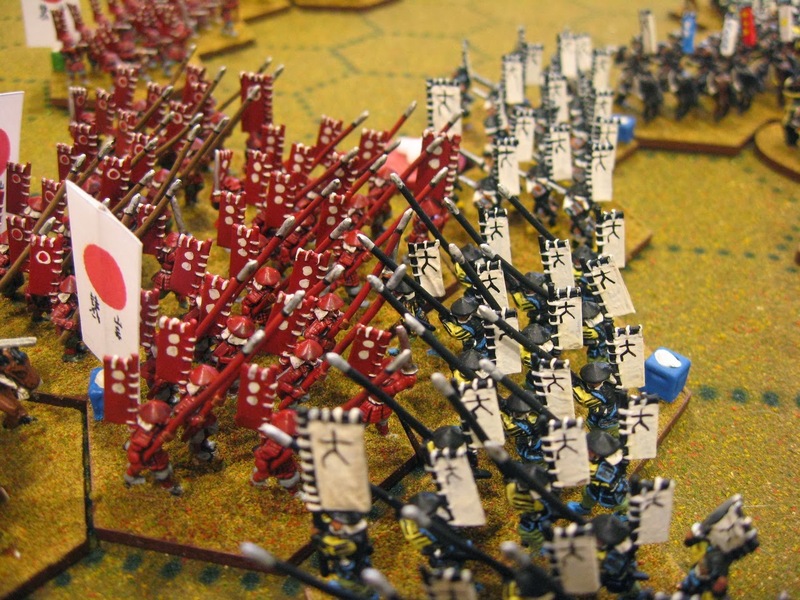 While Samurai Battles is an excellent two player contest, my thought is that solo play might suffer due to the interaction of both the Honor and Fortune and Dragon decks. 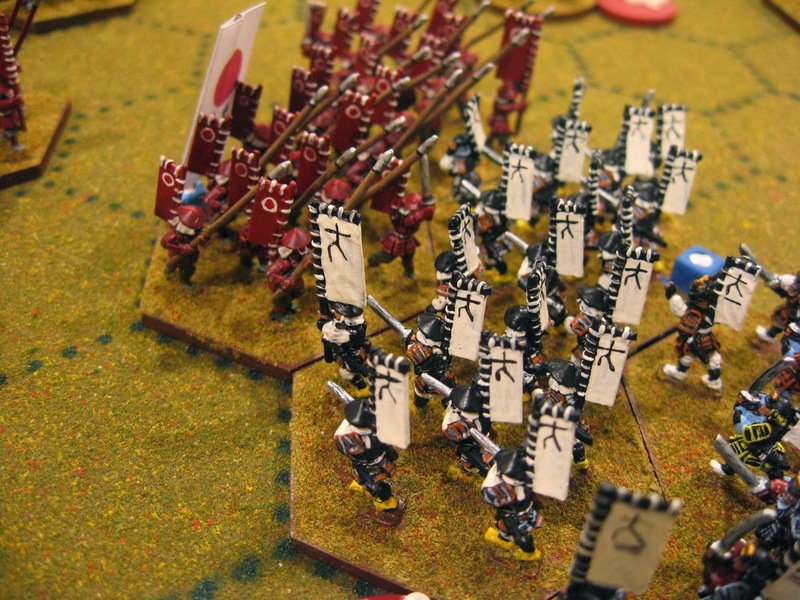 Really nothing beats the wild swings in Samurai Battles' games but for solo play the system poses a few hurdles. Impetvs games have, likewise, been enjoyable. A solution for solo play might include translating Impetvs to the hex mat. Sound reasonable? In keeping to the spirit of Impetvs movement and ranges, I set movement allowances to one hex for foot and two hexes for horse. Similarly, firing ranges become one hex, three hexes, and six hexes. In 15mm, movement allowances seem a bit stingy but I will keep the movement rates as is for now. Both lines advance to close the gap. Advancing to close the distance. 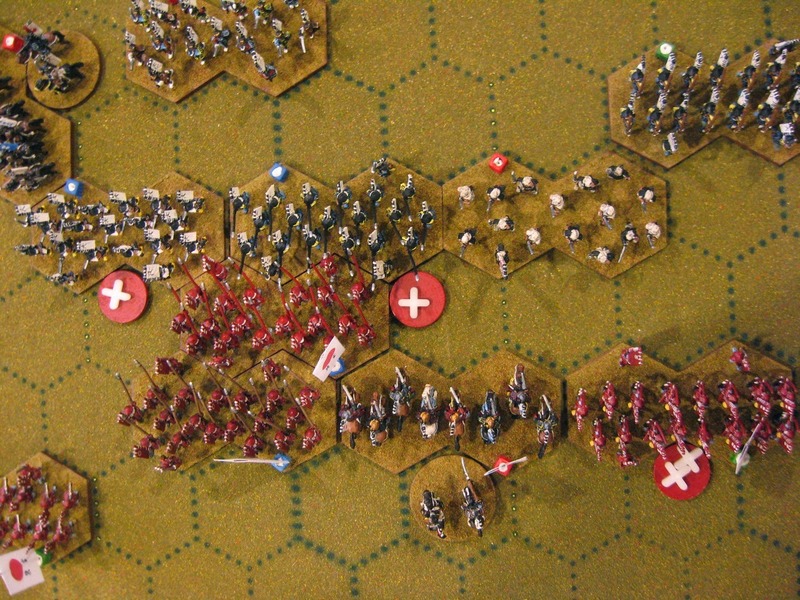 Red maintains the initiative and advances on both flanks. 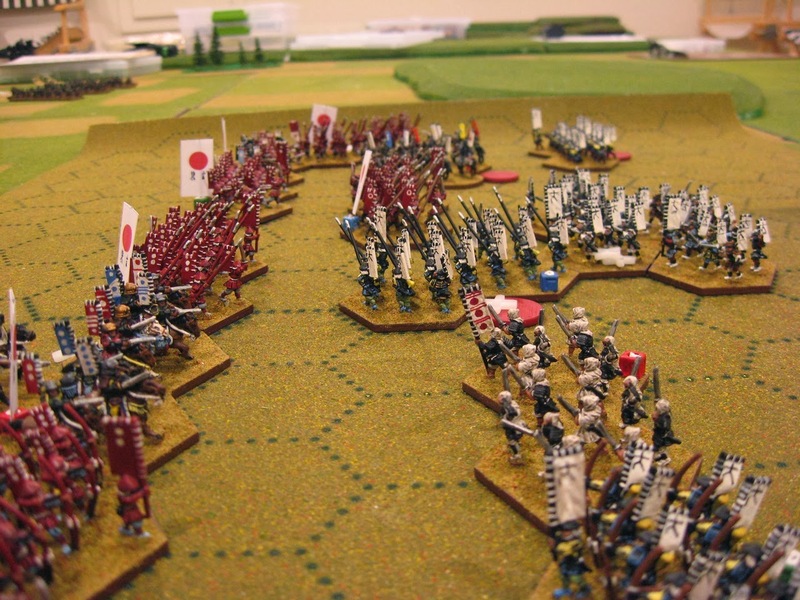 Red Teppo fire into White Ashigaru swordsmen and cause one hit. 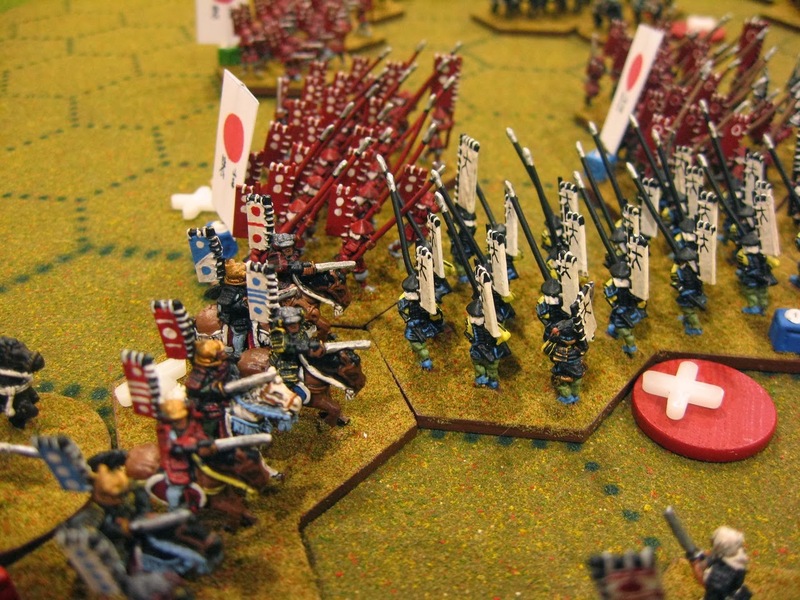 while White charges into Red's leading spear element. 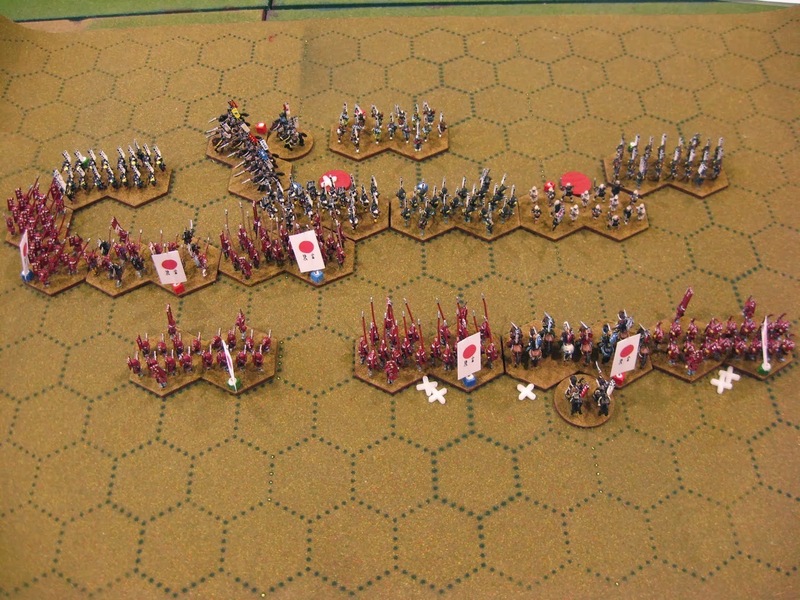 With no permanent losses, both sides are locked in combat. 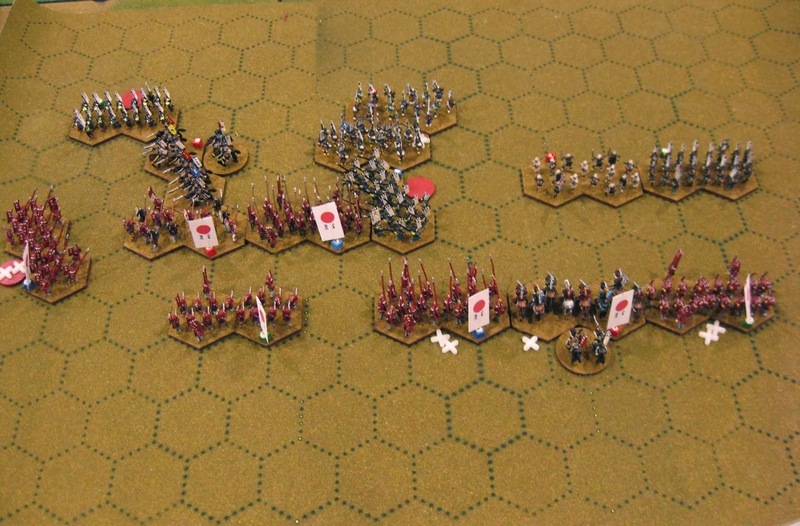 In the center clash, Red counterattacks. 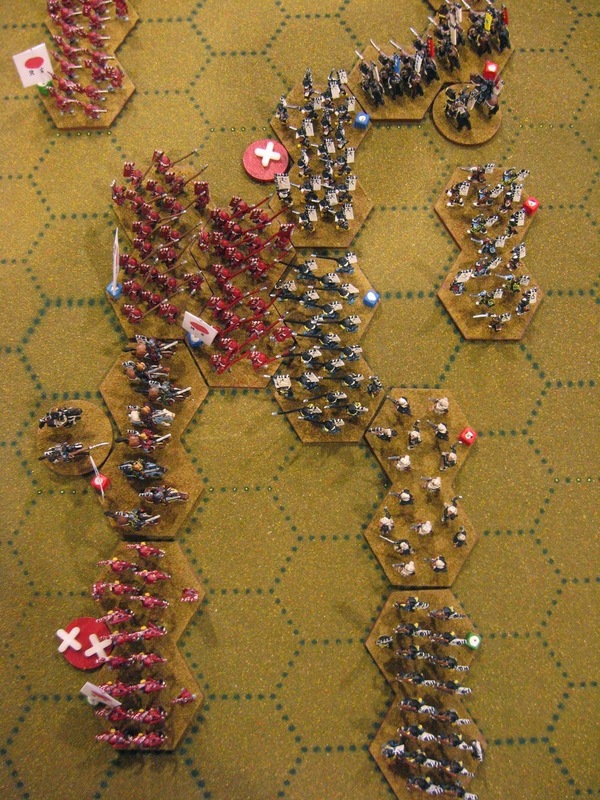 Red suffers one permanent hit and retreats one hex. 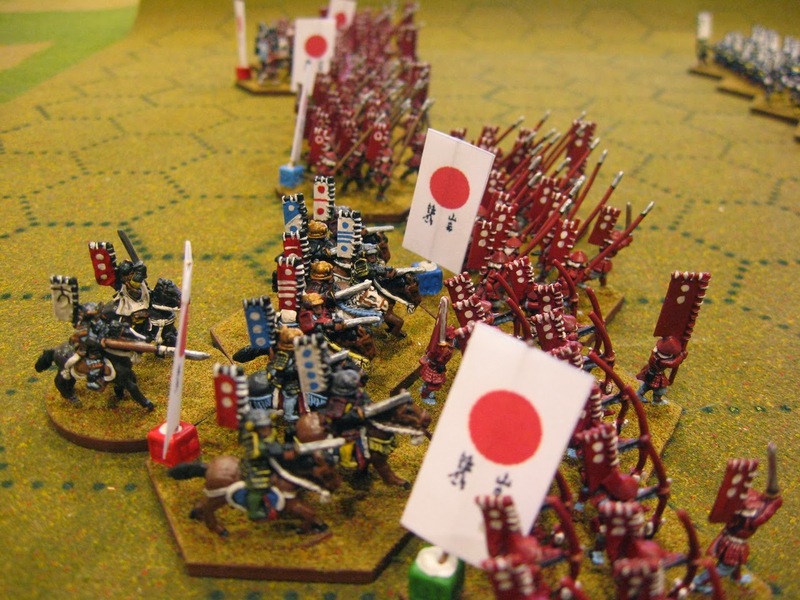 Red Samurai cavalry charge into the warrior monks. two hexes suffering one hit. Monks are disordered. are repulsed with heavy casualties. driving the swordsmen back onto supports. 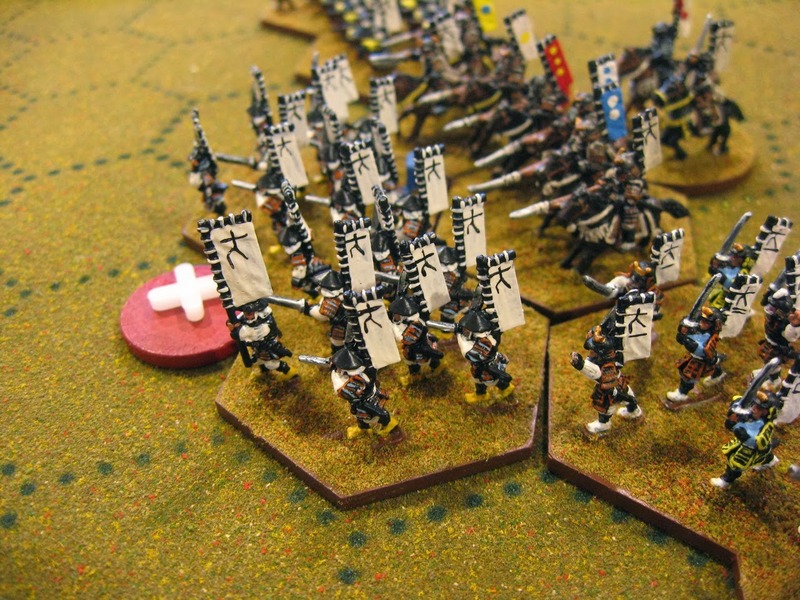 White cavalry respond by charging into Red's foot samurai. 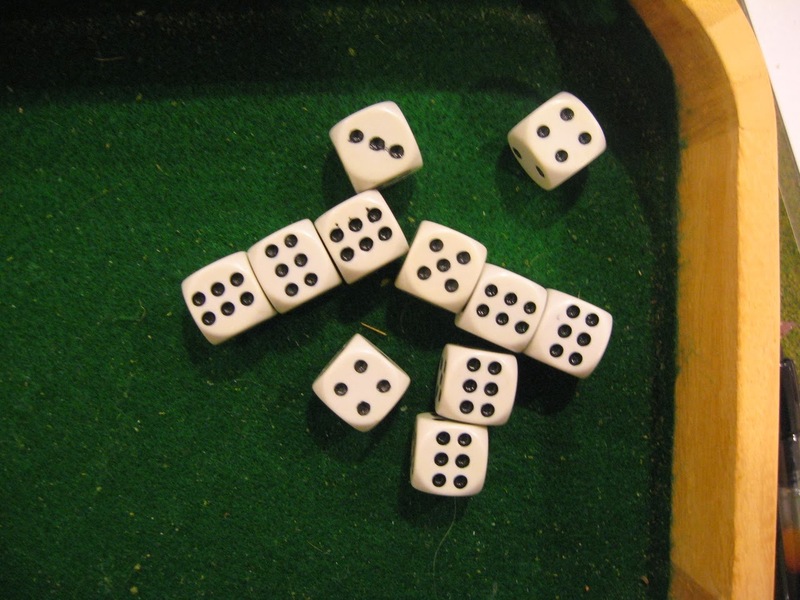 After rolling 7 hits against foot, only two hits are suffered permanently. 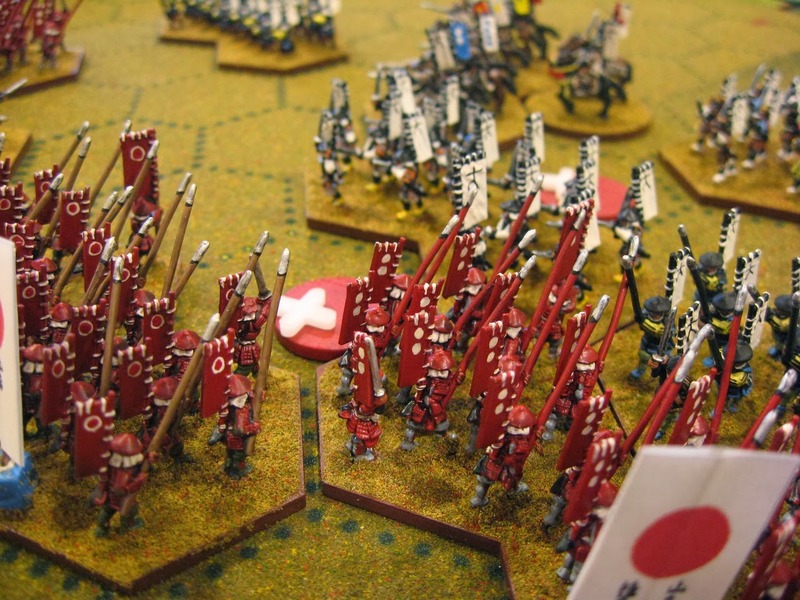 Red samurai fall back but are caught by the cavalry. In pursuit, the foot Samurai suffer one more casualty. White takes one hit but hold their ground. 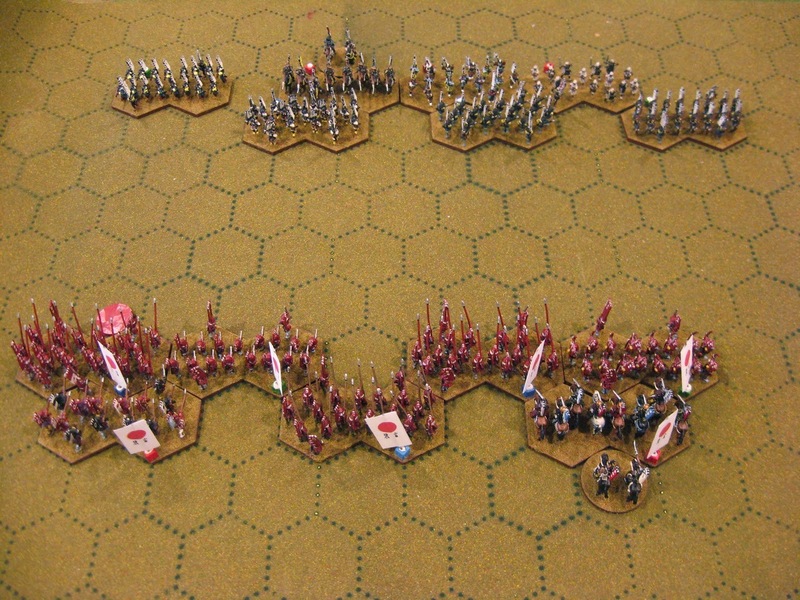 Red charges into the center while the Red left holds. 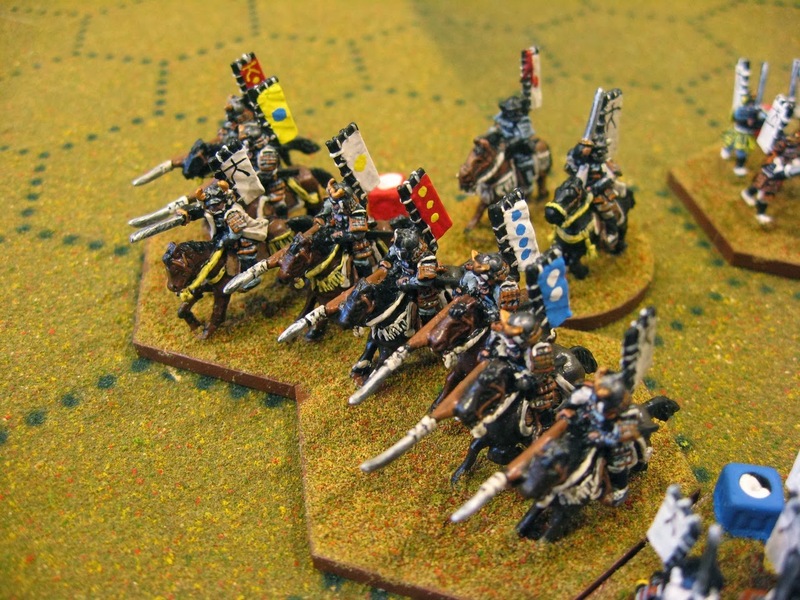 White spear are hit by both cavalry and foot. White takes two hits and retires. 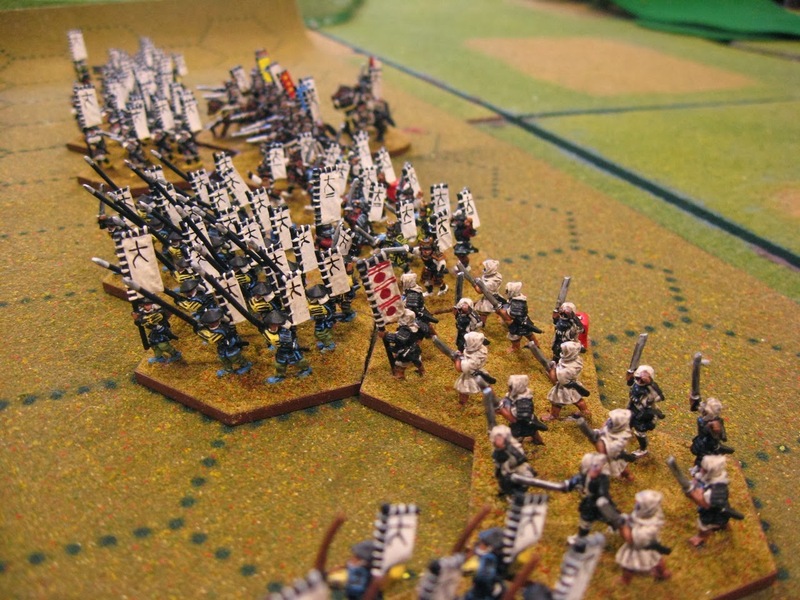 White spearmen are caught and destroyed. 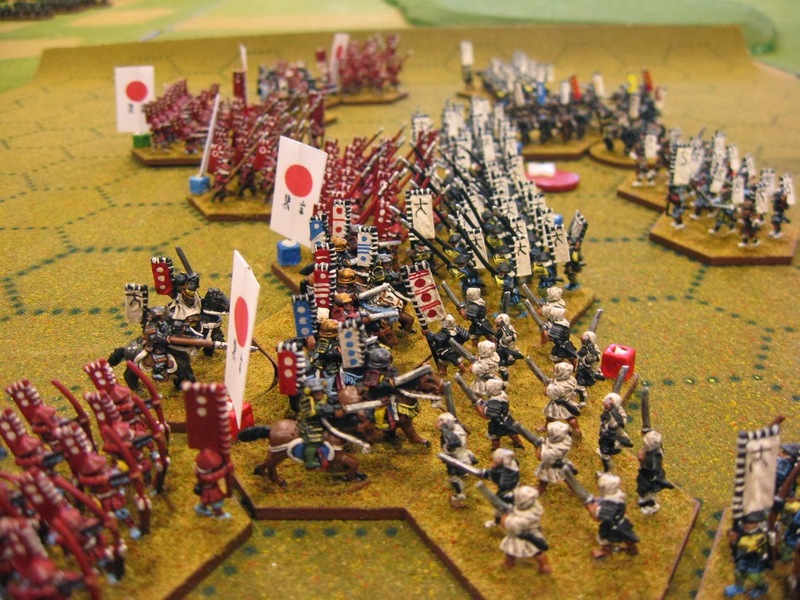 In the center, Red spear attack White swordsmen. Swordsmen suffer two hits while inflicting none. 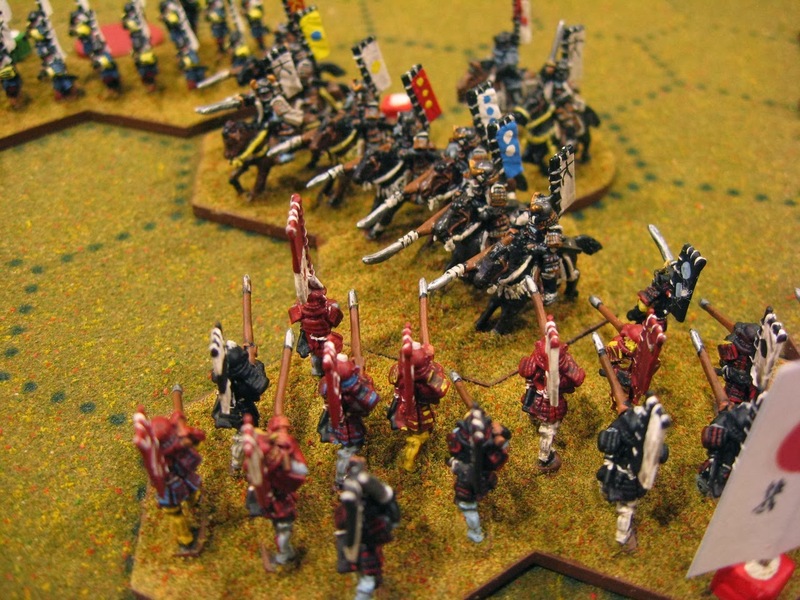 Swordsmen retreat but are caught and destroyed. 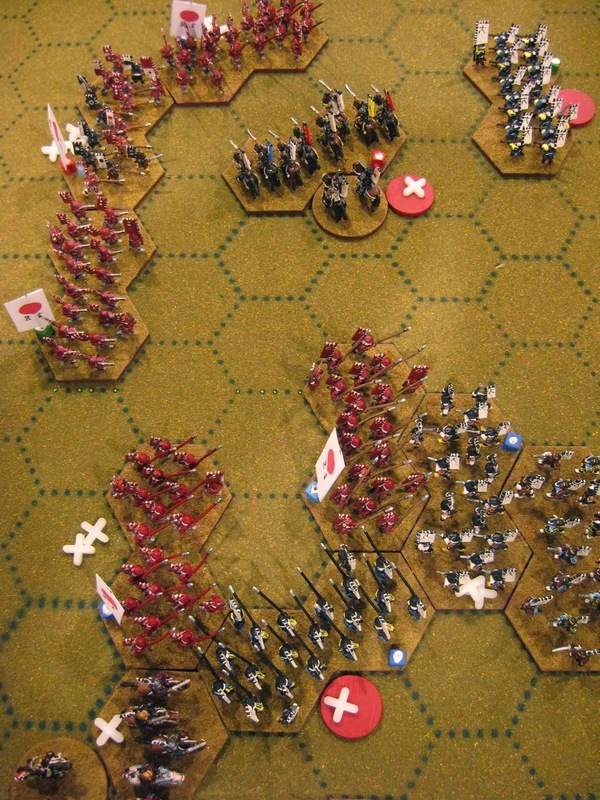 With two foot units destroyed on Turn 6, split command, and the center wide open for exploitation, White chooses to disengage. Thus, the battle ends with Red controlling the battlefield. Now, Impetvs games usually end with VBU damage greater than one-half of the starting army value. With the result clear, I decided to halt this exercise. Impetvs played on the grid was not much different from normal play. The game did play faster and much less time spent maneuvering and measuring. Although the level of excitement was not as high as in Samurai Battles, the game was enjoyable even in a solitaire setting. As mentioned earlier, movement rates may need to be increased above normal Impetvs rates to allow for a more dynamic game. In any case, further tests will determine if I prefer grid to no grid. For solo play, using the grid enhanced my enjoyment but as they say, "your mileage may vary." Andrew, if I make progress, you will see it here. It is intriguing. 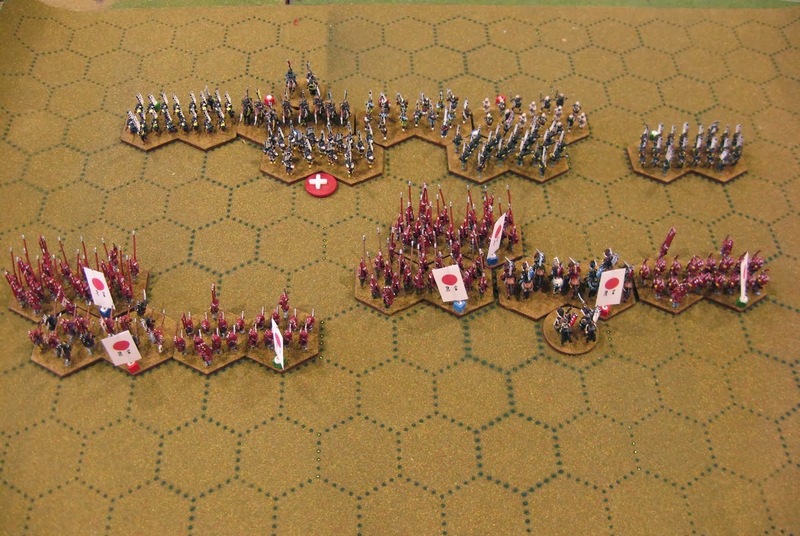 I think your double hex basing works well for this as it allows you to square up against your opponent on a "length grain" mat. I thought about trying the same thing with my 6mm stands, but rotating the hex grid 90 degrees so the hexes advance N/S instead of E/W. The hex based movement system also cancels out bonus moves for charges, and makes it hard for two units to "square off" resulting in a lot of 2 on 1 match ups. If you watch the Impetvs videos or examine the rule book, units NEVER square off. There will always be an offset. The hex grain follows this perfectly. In this game, I did give a charge bonus based on a die roll as well as a variable retreat/pursuit. An interesting report, I've never played any hex based games? And what a throw on the dice seven 6's!! Thanks, Ray! That was a handful of 6s. Thankfully for the recipient, only two of those hits stuck. Well if you have fun and enjoy the results then why not play on a hexagonal table. :-) The game sure looks good! Why not, indeed! Thank you, Christopher! Great experiment, I like the idea of making rules work FOR you! Thank you, Dean! I agree with you completely! I hadn't considered the aesthetics of removing rulers and measuring sticks from the table. Good point! Either way, I find somewhat longer move distances give a more dynamic game. Ranges from 3 for Javelins to 12 for Crossbows in LQ. Yes, we have discussed grid gaming before. Now I have taken the first step in converting a non-grid game to the grid (or hex). It is a very fine line between increasing the Impetvs move distances without upsetting the balance. I may make slight increases only. Great implementation of the idea! Very impressive. Appreciate your kind comments, Phil! Thank you for sharing these ideas. I enjoyed Basic Impetus. Could you add something like formation cards or some other kin of cards into the game to make more surprise? I appreciate your comments! 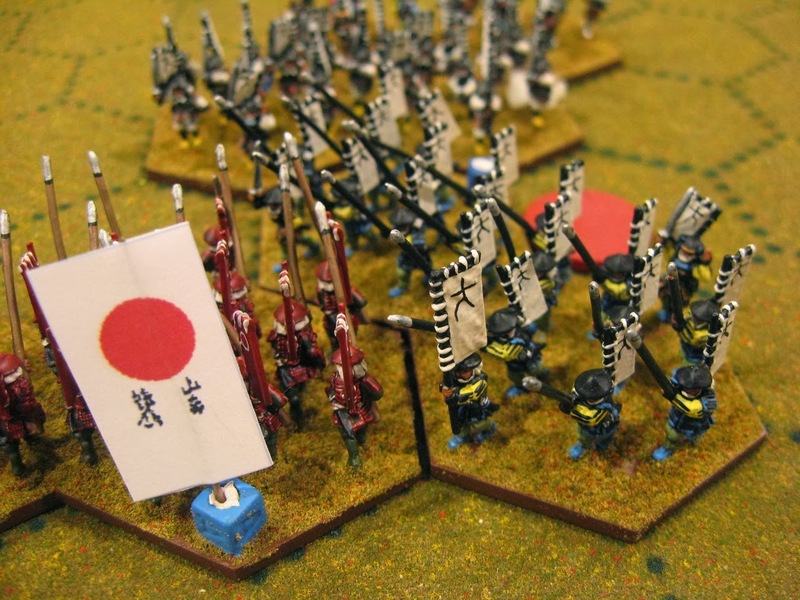 You could include cards to add randomness or surprise but Commands & Colors and especially Samurai Battles already includes those elements into the game. The card play and interaction in Samurai Battles with a live opponent is outstanding. For solo play, it might be a bit more difficult. Have you given Commands & Colors a try? Because Samurai Battles cards add so much to game play, I will be considering how to incorporate some of those ideas into Basic Impetvs.